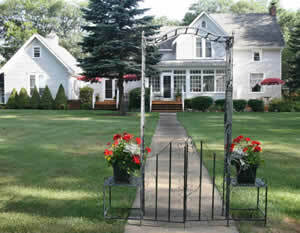 Discover the magic of the East Tawas Junction Bed and Breakfast Inn overlooking picturesque Tawas Bay on Michigan’s Lake Huron. 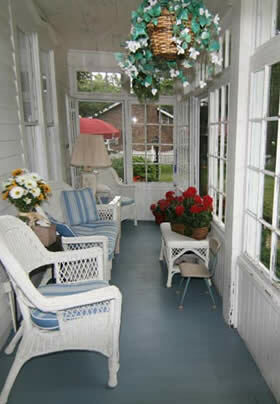 This century old home sits proudly upon an estate sized lot of lush lawns and stately oak trees. The East Tawas City Park, with its sugar sand beach, grand gazebo, outdoor grills and picnic tables is directly across the way from “the Junction”. Bike, jog, skip, hop or take a romantic stroll along the walking path outlining the Bay or kick off your shoes and give your toes a treat in the soothing waters as you make your way to the inviting Harbor Park and Pier with the Newman Street upscale shops, restaurants and theaters nearby. The guest entrance to the bed and breakfast leads one onto the furnished, glass enclosed wrap around porch before entering the main hall with a cozy, intimate library and antique fireplace tucked away on one end supported with a variety of books, CD’s, and DVD’s. The Sonos Music System allows one to choose selections to meet your mood. Passing through to your left, the main parlor with pocket doors, will entice you with its rich azure hand painted walls, ample upholstered seating, piano, flat screen cable TV and full mantled fireplace. To the right of the hall is the compelling dining room with cranberry walls, white trim and hand painted ceiling and soffit of Italian vista scenery complimenting the Century oval oak table and high backed rush seated Mediterranean chairs. Pocket doors lead to the game room where folks relax around the table, forgetting their computers and cell phones, to play one of the many table or card games available or just to chat, have a snack and relax with old and new friends. Two outdoor decks with umbrella tables and chairs are an added enjoyment for al fresco breakfasts, after which you might be tempted with a game of croquet or badminton on the spacious lawn. Later hours often draw guests to the decks to enjoy refreshments and quiet evening musings as they catch the breathtaking view of the moon over the Bay. Our guests include business travelers, vacationers, those celebrating weddings, anniversaries, special family events and group meetings who enjoy the many public areas and welcoming warmth of the home designed with their comfort in mind. Ample parking for boats, trailers. Garage storage for bicycles. There are six rooms including three rooms on the second level of the historic side of the home, a King and two Queens. Another two rooms, a King and a Queen, are located on the main level in the new addition and an additional room with twin beds on second level of new addition (described on our Rooms and Rates page). 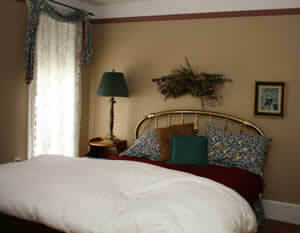 All rooms have central air conditioning and WI-FI access. Small refrigerators are located nearby. The Chef’s “Specialties of the House” are served at table, buffet or a combination of both and include a variety of baked egg entrees, stuffed French toast, frittatas and waffle dishes with various toppings. 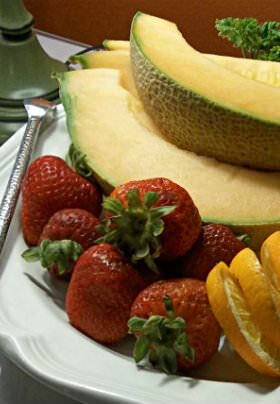 Fresh fruits, variety breads, juices, coffees and teas as well as traditional breakfast dishes. An attempt is made to discuss the breakfast menu with our guests preceding the next morning’s meal. Special diet restrictions and preferences are honored. These will be discussed after your arrival. Tawas. Great fun and something (or things!) for every one. Very popular with vendors from surrounding states. The rooms are very tidy and nice, though not particularly large. We had the main floor suite that opens to the outside. Expect it would be quite nice in summer. The owner, Leigh, was great and cooked and served a nice breakfast. Has a small, and very at home feel. 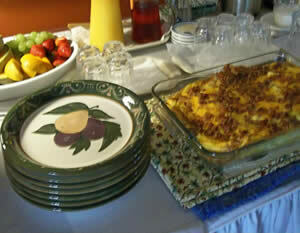 Can request any type of breakfast to be made for you while you stay. This is a new yearly stop for the wife and I. Great location, walked to the beach, restaurants, shopping.... The owner is a sweet lady that will ensure your stay is pleasant. See you next year.